The tool converts AOL PFC file to PDF file in bulk and all converted PDF files are organized according to the subject and signature of emails. This helps to search particular mails content easily. The tool has been chosen by many certified companies for the same purpose. The software not only converts AOL PFC to PDF but it also converts PFC file into multiple other file formats, like: This feature allows users to use converted file on different email clients, for e.g. : MOBX for Thunderbird etc. 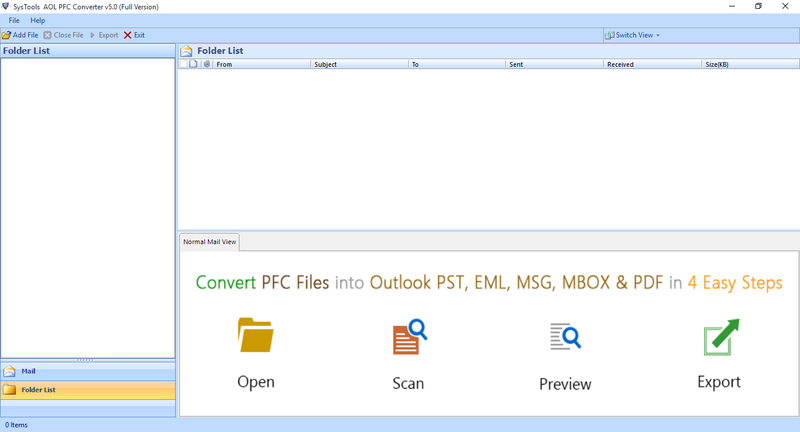 The tool allows users to convert only selected emails into PDF & other file formats. This feature lets users save their important time by giving them the option to convert only those emails into PDF that they need. 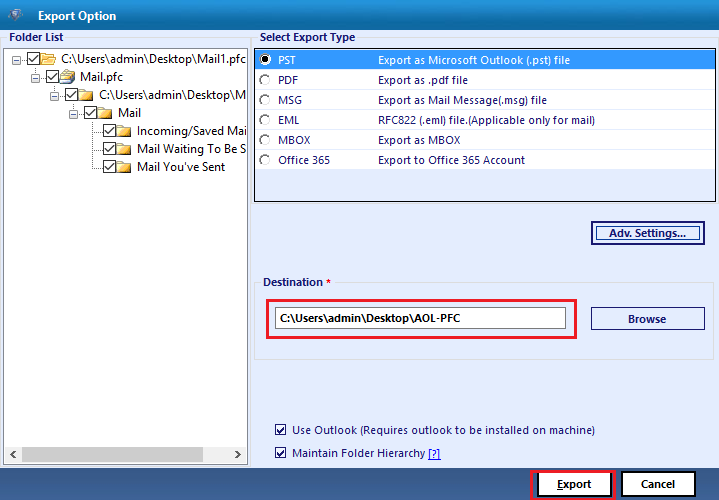 Users can view stored mails from PFC file before proceeding for conversion process. After viewing mails users can decide which mail should be converted and which should not. The tool allows users to convert multiple AOL PFC files in bulk. However, to achieve this, users have to select PFC file one by one to the software. Later on users can export all files at once or separately. AOL PFC to PDF converter software supports all versions of Windows Operating System from Windows 10 to Windows 2000. There is no additional plugins of any supportive tool required for running this software. AOL PFC file is an offline email-storage file, which is used to store AOL emails on user's computer locally. This enables emails to be accessed locally without internet required. If any changes are done by user, like email sending then users have to connect to internet. PFC file allow users to read emails without internet and it keeps record or each changes and whenever internet connection is connected then the changes is automatically synchronized at server. AOL PFC Converter software is really a good tool for those who were using AOL Desktop for email services but now shifted to another mailing service. In any case, the user again needs to view emails from locally stored PFC file. In this case, users can convert AOL PFC to PDF file for reading emails. Can I use this software to convert PFC on my Mac Machine? The tool can be installed and used to convert AOL PFC to PDF only on Windows OS based machine. I have 7 PFC files and want to convert them in PDF but quickly. How is it possible? Yes, the tool is able to convert all PFC files in Bulk but to achieve this you have to add all PFC files one by one to the software. In addition, after this the tool can export all emails in PDF at Once. Does this tool allow selective items conversion option? Yes, AOL to PDF conversion tool allows you to convert only selective emails into file formats. Does this tool convert attachments too or it will convert only text of emails? Yes, the tool converts email text with all attachments. The software considers text with attachments as a single Email. So you need not to worry regarding any email attachments. I had a lot of AOL emails stored as PFC file in my computer but I was needed to read some emails time to time or once in a week. But my data is very important, so I was worried to trust on any tool. However, when I tried demo version of AOL PFC to PDF converter tool, I was sure that this tool is suitable for my work. Earlier, I was using other tool for conversion of AOL PFC files. The tool was converting one email at a time in PDF & EML file format. But after purchasing EmailDoctor's AOL PFC file converter tool I am converting all my required emails from PFC file to PDF & file format at once.